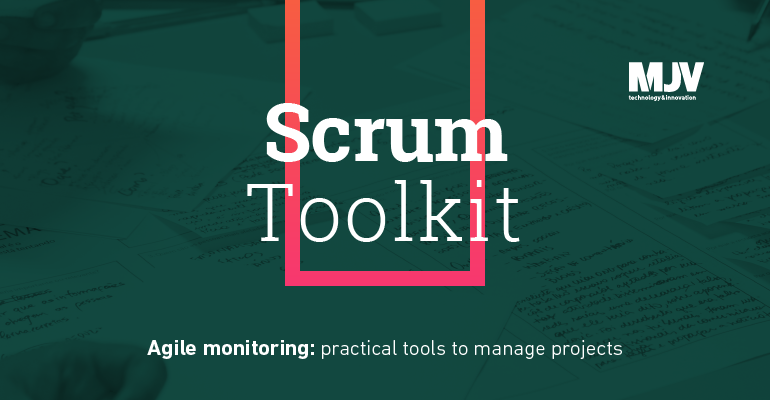 If you have already downloaded and used the agile planning tools, it’s time to move on to process tracking through Scrum. After downloading and printing our toolkit, you should be able to manage the project by following the evolution of the stories that were created and approved. By using the Scrum Board and the Burndown Chart, the team can see if the effort employed and the deliveries made are in balance with the goals set for the project and, from this, strategically think about which actions bring better results. This is one of the advantages of applying agile methods such as Scrum. Since it is based on continuous change, it allows you to identify difficulties and adjust throughout the project. 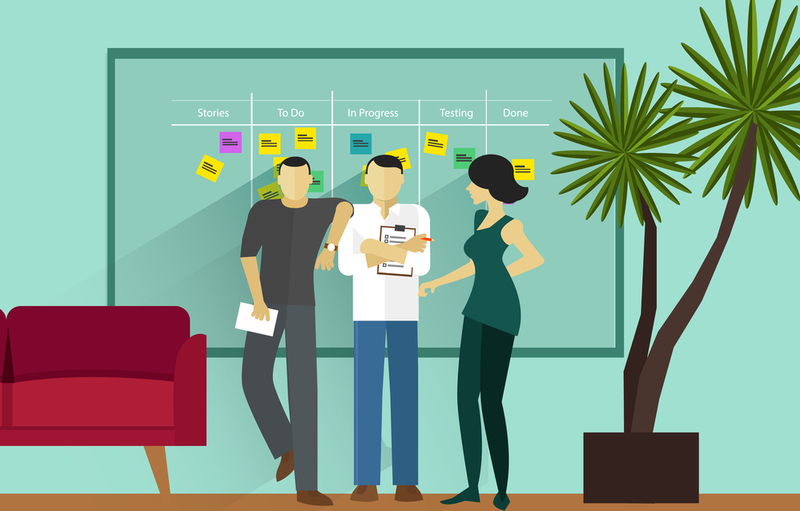 The Scrum Board is a framework that helps the team see the level at which the development of the story is in order to manage the project, and this is done by dividing it into different columns: To do, Doing, Testing and Ready. Each member prioritizes their roles through colored adhesive paper on the Scrum Board, moving the stories until they are completed during the sprint. It is important to keep it updated, so everyone involved has a clear idea of how the project is going and what he or she can do to contribute to the agility of deliveries. The Burndown Chart works as a gauge for the team’s performance. The graph shows, on the horizontal axis, the days of the sprint and, on the vertical axis, the story points, starting from the maximum sprint points to zero, which are indicated at the end of each day. As the story points advance daily, it is possible to see the chart take shape, which indicates the advance of the story points finalized by the team. The straight line represents customer demand in that period (sprint). The visibility of the pace becomes greater, allowing you to analyze if the goal of the sprint will be achieved. 1. Position the Scrum Board somewhere the project team can access it, so they can fill in their stories. 2. Transcribe the Backlog stories to the Scrum Board in order of priority. 3. Identify when the actions of each story take place with colored adhesive paper: To Do, Doing, Testing, or Ready. 4. 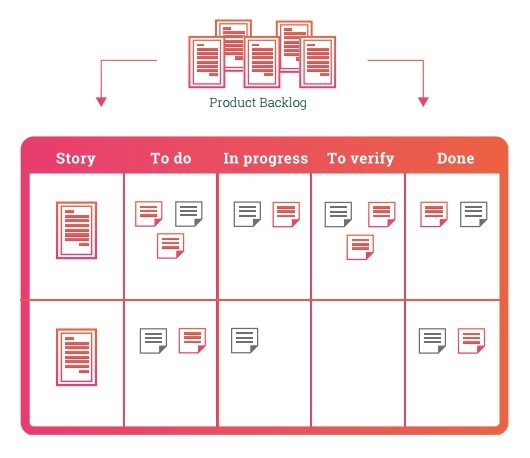 As actions progress, update the Scrum Board with the status of each story until it reaches the “ready” stage. 1. The first step is to put the sprint days on the horizontal axis and the story points on the vertical axis. At the top of the vertical axis, you have the number that represents the sum of all story points in the sprint. Then, draw a line from the total (top of the axis) to the last day of the sprint. 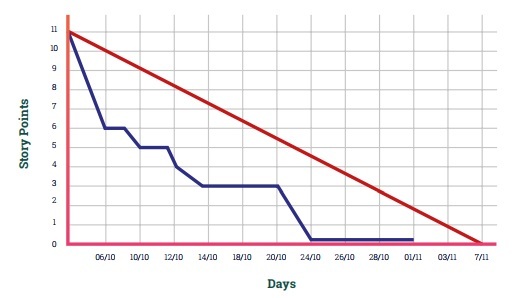 The blue line in the image points to the planned total and the actual demand by the customer during the sprint. 2. At the end of each day, indicate how many story points have been completed in the chart. Throughout the process, a variable line will form (represented by the red line), demonstrating the team’s pace in the sprint. The closer it is to the blue line (planning), the better. Do you wish to receive MJV’s content in your email? Sign up below!